Bubble Soccer is the perfect game for birthday parties, special events, corporate team building or just for fun! Groups must be between 4-6 people. The minimum age for bubble soccer is 12 years. Rubber soled shoes must be worn. You'll be contacted by one of our friendly staff members to confirm the start time before your game. Monday and Friday 1:30pm can be booked via special arrangement. We require 72 hours notice for online bookings, with less notice being made via contacting the office directly. For further information, please contact Macquarie Ice Rink (02) 9888 1100. Please fill out the details below and we'll call you back to secure your booking. Otherwise you can give us a call on 02 9888 1100. Everyone over 18 years old must sign a waiver before participating in any bubble activity. If under the age of 18 years old the waiver must be signed by a parent or guardian. BUBBLE SOCCER is available for kids aged 12 years and older. 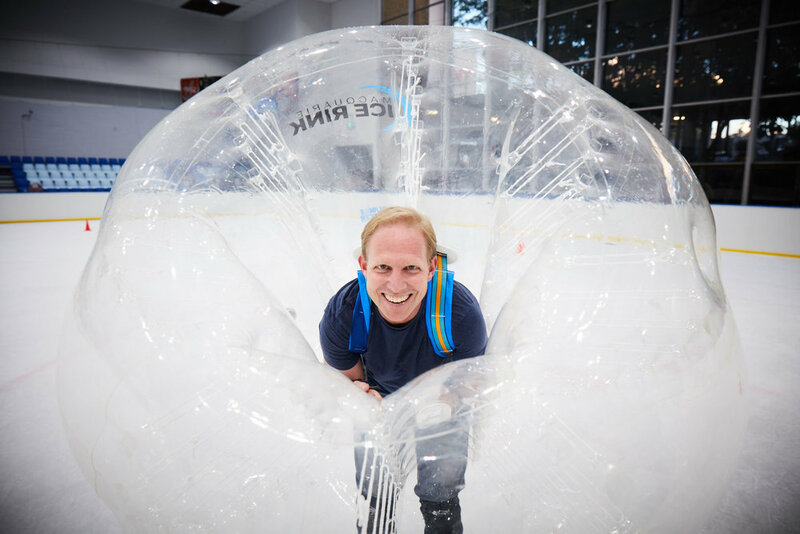 For the purpose of this terms and conditions, Macquarie Ice Rink (NSW) Pty Ltd ACN 002 717 320 (Macquarie Ice Rink), refers to the company and all associated staff who are running the Bubble Soccer events. The "Client" refers to the parties involved in bookings, communications and participation in events whether as a player or observer. 1.1 BOOKING CONFIRMATION 1.1.1 All bookings will be confirmed via email when the terms and conditions have been agreed to and initial 20% deposit paid. 1.1.2 If no deposit is received or the Terms and Conditions are not agreed to, no booking will be made. 1.2 WAIVER FORM 1.2.1 Individuals are restricted from play unless a waiver form has been filled out and handed to the staff on game day. 1.3 PAYMENT 1.3.1 A 20% deposit is required to confirm the booking or payment can be made in full. Payment can be made in person or by using the payment details below. 1.3.2 Deposits are due at least one week prior to the event. Final payments are due within two days of the event. (Unless otherwise authorised by Management). 1.4 CANCELLATION & REFUND 1.4.1 Cancellation by client If cancellation occurs 7 days or more before the date of the event the 20% deposit (and any other associated payments) will be refunded in full. If cancellation occurs less than 7 days but more than 3 days before the event the deposit will be forfeited. If cancellation is made less than 48 hours before the event a cancellation fee of 50% of the total event fee will be charged and left over payment will be refunded. In case of a no show no refunds will be available. 1.4.2 Cancellation by Macquarie Ice Rink or AMP In any case of cancellation by Macquarie Ice Rink or AMP An option of a full refund or game re-scheduling is available. 1.5 LOSS AND DAMAGES 1.5.1 The client is responsible for or agrees to indemnify Macquarie Ice Rink and/or the property of other clients,venue, guests or general public at an event. 1.5.2 The client agrees to repair or rectify any damages caused by negligence to any equipment owned by Macquarie Ice Rink and to cover any additional costs that may occur. 1.6 GAME SAFETY AND BUBBLE SOCCER RULES 1.6.1 Bubble Soccer Rules and Games Safety Guidelines are as follows: 1. All safety decisions and rulesare at the discretion of the staff member on the day. Their say is final. 2. The rules and regulations of all games can be found in Macquarie Ice Rinks games guide and code of conduct (and see below) which will be provided on the day. 3. The following core safety rules must be adhered to: a. When a player is down you must give them space and time to get back up. You must not bump into or jump on a player that is down. b. You can not charge into any player who does not have a suit on. c. No purposeful contact should ever be made to the bubble with your feet. 1.7 CODE OF CONDUCT 1.7.1 Macquarie Ice Rink staff members have final say in all decisions. 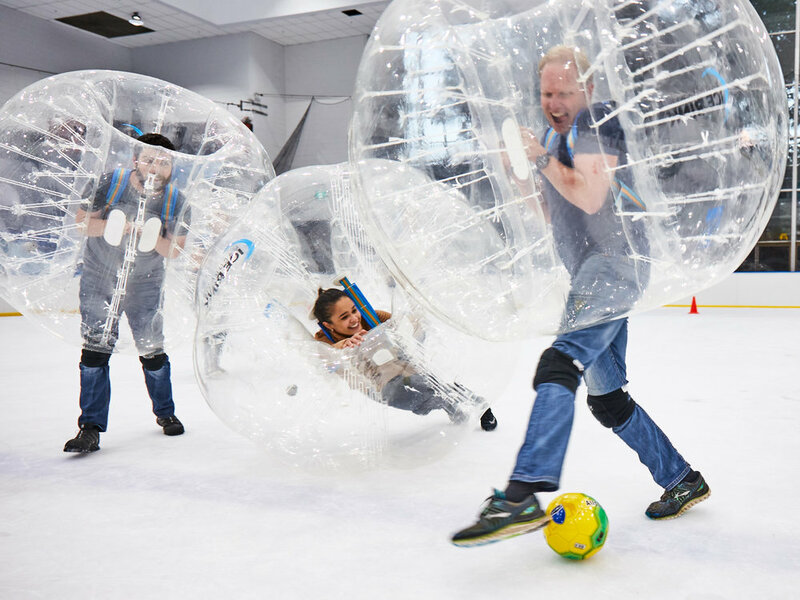 1.7.2 Proper clothing must be worn at all times while participating in the Bubble Soccer activities. Only flat-soled shoes with no spikes on them - no sandals or thongs. No jewellery, glasses or any other accessories that may injure you or damage the bubble ball suit. You should wear long pants and knee guards. 1.7.3 Players are not allowed to kick the bubble balls at any time. We realise that, on occasions, when you are on the ground (ice) , your feet may come in contact with another bubble ball, but please refrain from kicking it or rubbingyour shoes against it. 1.7.4 Players will not be permitted to participate in any bubble ball activities while under the influence of alcohol or drugs. Any player that does so unbeknownst to the Macquarie Ice Rink staff does so at their own risks and takes full responsibility for any consequences that may arise as a result of such. 1.7.5 Excessive swearing and/or inappropriate or rude comments will not be permitted. We understand some may slip, especially with the nature of the activity, but try to be respectful of the people around you. 1.7.6 Any purposeful attempt to pop or damage the bubble balls will result in an immediate removal from the activity and the participant will be banned from using them again. Participants will also be required to pay for the cost of fixing or replacing the bubble balls. 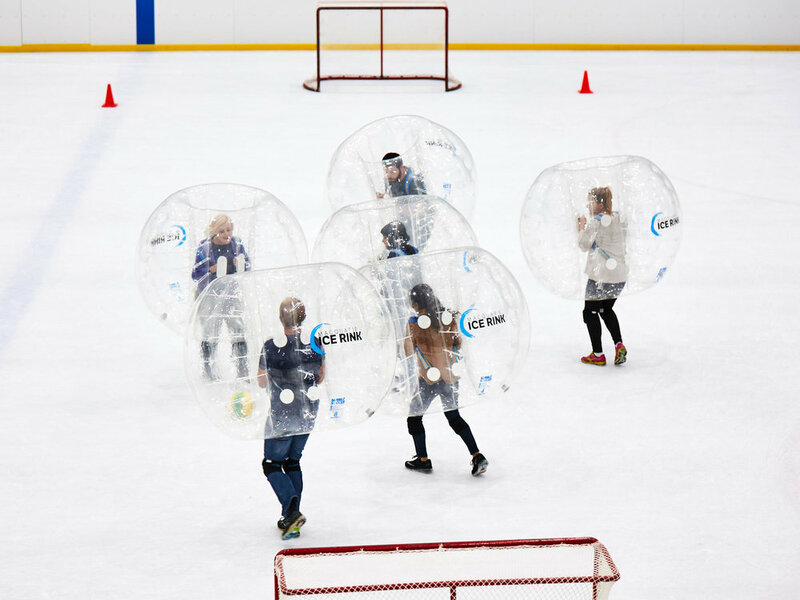 1.7.7 Macquarie Ice Rink recommends that each participant has personal insurance and a physical before participating in any physical activity such as bubble soccer. 1.7.8 Players not in a bubble ball are not allowed onto the ice unless they are skating in a separate area of the rink. 1.7.9 Players must sign a waiver before participating in any bubble activity. If under the age of 18 years old the waiver must be signed by a parent orguardian. 1.7.10 Long distance, full speed collisions that are planned for fun or videoing are strictly prohibited and are ground for terminating the remainder of the event. We apologise for the inconvenience, but those unnecessary collisions can cause damage to the bubble balls and cause injuries in many forms. We want to take care of your safety and the bubbles to provide the best experience possible for every customer. Thank you for submitting your bubble soccer booking form! One of our friendly staff members will call you back to secure your booking. Please call us on 02 9888 1100 if you have any further enquires.